NBC’s new interactive game show that will be played in real time by American across the country hosted by Ryan Seacrest will air live from a gigantic hourglass-shaped structure in the heart of Manhattan. The revolutionary game show is currently searching for contestants! If you want to compete on the show, casting is looking for contestants that are willing to test the limits of their knowledge, endurance all for a chance to win on the biggest game show ever imagined. The search begins in Washington D.C. (August 10), Boston (August 14), Philadelphia (August 18), and New York City (August 24). Potential contestants must be 18 or over and legal U.S. residents to enter. Updates, pre-registration forms, audition tips and a full list of details with all venue information can be found at www.millionsecondquizcasting.com. “The Million Second Quiz” will be the first fully convergent television experience, where viewers will be able to download the show’s game app and play along at home in real time by syncing to the live prime time broadcast each night. The entire competition takes place 24 hours a day for over 12 days. Contestants will be pushed to the limits of their knowledge and the breaking point of endurance as they compete in quiz bouts around the clock. Live, interactive, intense and unlike any other game show in history with the largest guaranteed cash prize in game show history, this is truly the chance of a lifetime. WASHINGTON D.C. – Saturday, August 10 from 10am – 6pm at “Madam’s Organ”, 2461 18th St NW, Washington DC, 20009; BOSTON, MA Wednesday, August 14 from 10am – 6pm at “Tequila Rain”, 3 Lansdowne St., Boston, MA 02215; PHILADELPHIA, PA – Sunday, August 18 from 10am – 6pm at “McFadden’s”, 461 N. 3rd Street, Philadelphia, PA 19123; NEW YORK, NY – Saturday, August 24 from 10am -6pm at “NBC Experience Store”, 30 Rockefeller Plaza, New York, NY 10112. 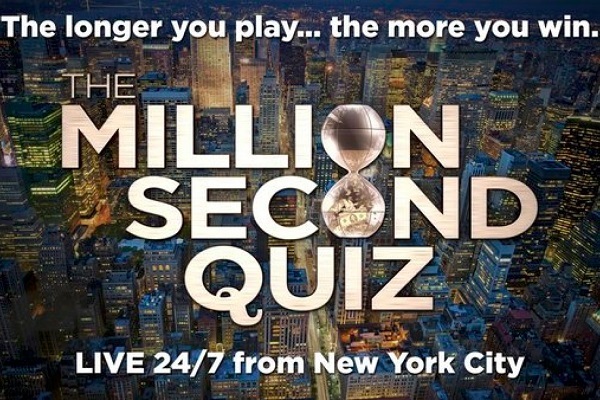 Throughout the month of August, a “The Million Second Quiz” branded tent will be traveling across Manhattan and the 5 boroughs of New York City, including popular festivals and events, looking for potential contestants. Please go to www.millionsecondquizcasting.com for more information and specific locations. “The Million Second Quiz” premieres Monday, September 9 at 8pm ET.